You can tailor the visual design of the Login page to make it fit in with the branding of your internet or intranet site. The General page is displayed. Scroll to the Branding > Login page section. In Background, select Color from the drop-down list. In the text box , enter the name of the required color or its hexadecimal value #RRGGBB. e.g. green or #00ae5b. In Background, select Image from the drop-down list. Click Choose File; then locate the image. The image must be in PNG or JPG format and for best results should be sized 1366px x 768px. Click Choose File next to Logo; then locate the logo image file. The image must be in PNG or JPG format and for best results should be sized 250px x 64px. In Instructions, enter the text. You can use HTML tags to add links and formatting. Use this text to explain which username or password to use (if you have multiple logins at your organization). The maximum number of characters is 1,000. In Button color, enter the name of the required color or its hexadecimal value #RRGGBB. e.g. green or #00ae5b. The changes are reflected on the Login page. 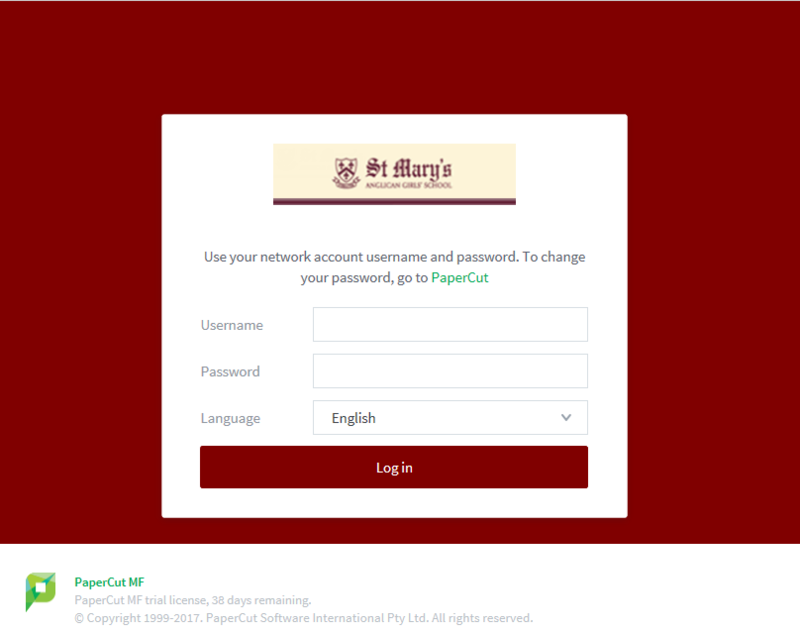 If you modify the Background or Logo, the Login page footer displays PaperCut Software International Pty. Ltd. co-branding. 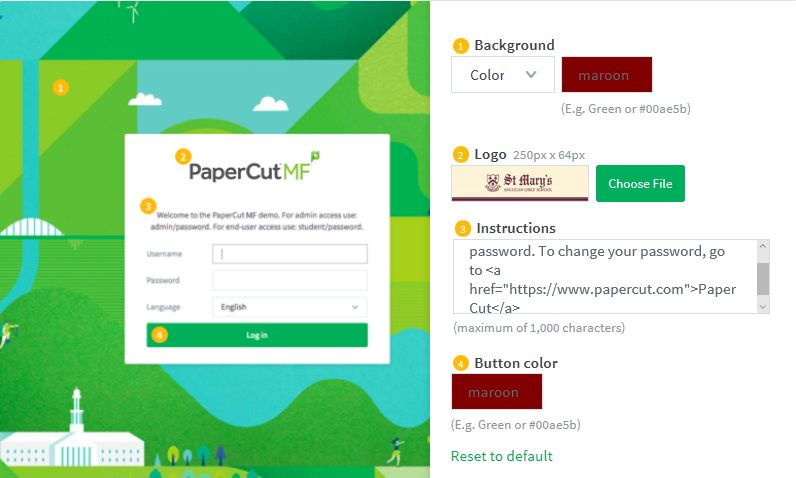 To undo the changes made and restore the default PaperCut NG/MF styling, click the [Reset to default] link. auth.web-login.autocomplete Specify Y to enable browser auto-completion of the login fields as a convenience to users. By default, the browser is requested to not use auto-completion. See Using the Advanced Config Editor for more information about changing the value of config keys.